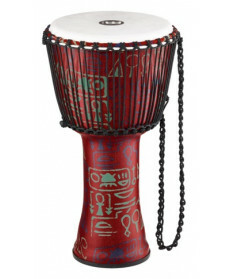 Djembe Meinl PADJ2-M-F 10" Travel Djembe. Cor: Kenyan Quilt. The new MEINL Travel Series Rope Tuned Djembes are great drums for professionals as well as those who just want to enjoy an afternoon playing at home or with a drum circle. 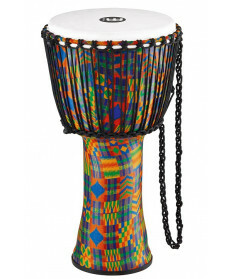 Djembe Meinl PADJ2-L-G. Cor: Kenyan Quilt. 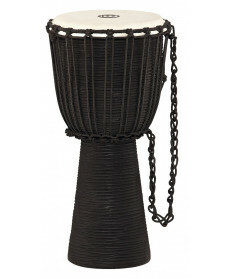 Djembe Meinl PADJ1-L-F 12" Travel Djembe. Cor: Pharaoh's Script. The new MEINL Travel Series Rope Tuned Djembes are great drums for professionals as well as those who just want to enjoy an afternoon playing at home or with a drum circle. Djembe Meinl HDJ3-M 10" Black River Series. Cor: Black. These Djembes are made from a solid piece of plantation grown Mahogany wood, and are hand carved with a horizontal ripple motif that suggests a flowing river. 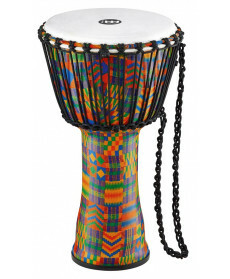 This also makes the djembe easy to hold between the knees.